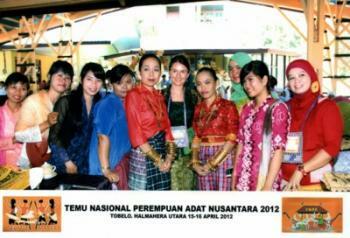 At the National Indigenous Women’s Meeting in Tobelo, 15th-16th April 2012, I was welcomed with open arms by over 200 women from all over the archipelago. Each one of them was fully committed to promoting indigenous women’s rights as well as being proud representatives of their culture and heritage. Several of them spoke of the human rights abuses and ecological injustices experienced in their communities as a result of massive deforestation (usually for palm oil plantations) and mining projects. They spoke about this with sadness, but with determination to represent their communities in finding justice and peace for their people. 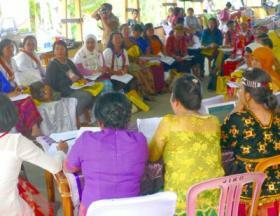 I watched the women, of all ages and backgrounds, work together through group discussion to build the formal governance structures required to form the ‘Perempuan AMAN’ - the first ever formal alliance of indigenous women across the archipelago. The celebrations of dance which followed were a display of their unity and positive spirit for change. The combination of women’s knowledge of natural science, their skills in managing and monitoring the land, and their social positioning to help with community capacity building and training , makes them powerful agents of change. Indigenous peoples are most directly affected by climate change because their lives and livelihoods depend largely on natural resources, and none more-so than indigenous women who manage and maintain natural resources for their communities. The combination of women’s knowledge of natural science, their skills in managing and monitoring the land, and their social positioning to help with community capacity building and training , makes them powerful agents of change. Consequently, women play a vital role in implementing climate change mitigation and adaptation strategies within local communities. It is essential that women are valued and recognised for these skills, at the local, national and international level so that adaptation and mitigation strategies are built from the bottom up, using local knowledge and wisdom. Indigenous women must be provided with opportunities to learn more about the potential impacts of climate change on their communities and land. They should be given the status and authority to be involved in formal decision-making processes and the implementation of solutions, to inform international policy development and to guide their communities through climate change. The formal establishment of the Perempuan AMAN provides an opportunity to unify and amplify the efforts and the voices of these women across Indonesia. It is now the responsibility of their communities – and the rest of the world - to open their minds and listen. Clare McVeigh (centre) with participants at the National Indigenous Women’s Meeting, Tobelo April 2012.